You’ve probably seen news reports about the supposed plot to blow up JFK airport. Pretty scary stuff, right? Bold claims, you say. Damn right. But let’s look at the facts — ALL of the facts — before we decide. The media tends to focus on the most frightening and explosive (pun intended) parts of the plot, but they seldom go deep into the details and question the government’s motives and their version of events. Fact One: Most of the “plotters” were in their 50s and 60s. Not exactly the spry young wannabe martyrs we’re used to seeing. Fact Two: The plotters had no experience with terror attacks. They were still in the planning phase and they had no funding necessary to pull this plot off. And frankly, these guys were incompetent… and set up. 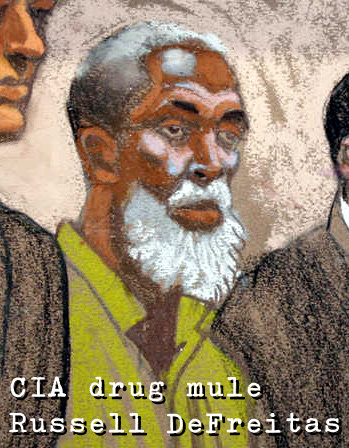 Fact Three: “Terrorist mastermind” Russell DeFreitas was employed by the CIA. Yes, Russell DeFreitas used to work for Evergreen International Aviation, which is a notorious front for the CIA. The airline was most likely involved in the extraordinary renditions you may have heard about (basically the CIA flies suspected terrorists to other countries where they can be tortured “legally”). I think this goes without saying, but I’ll say it: The CIA doesn’t staff it’s fronts by hiring the first moron who comes in off the street. Okay, they might do that in some cases, maybe even this one, but once you’re involved with The Agency it can be hard to get out of their wicked web. Perhaps The Agency saw how gullible and easily manipulated DeFreitas was and decided to use him as a patsy without his knowledge. Or perhaps he was aware of what he was doing the whole time. Either way, the CIA angle puts a whole new spin on things, especially since the CIA is the premier terrorist organization in the world today. The Agency is in a vastly superior position to its mules. Mules can get pinched at any time, with or without a tip from The Agency. Then, in order to get a reduced sentence said mule will cut a deal with the CIA and do exactly what they tell him to do. If he doesn’t, he spends time behind bars and The Agency simply finds another mentally deficient mule/patsy. All things considered, this plot looks extremely sketchy. The plotters were being led by a former (current?) CIA stooge who couldn’t manage to keep his car running, yet the media is hyping this as a foiled 9/11-style plot. DeFreitas was a former jazz musician and aficionado, yet music is banned in many Islamic countries. Is this guy your standard loner/drifter or a extremist terrorist mastermind? The truth appears to be somewhere in the middle. DeFreitas’ motivation was probably money. The Agency tells him to start acting Islamic and formulate a bomb plot and he does exactly that because he expects a fat payday. Will he ever get paid? Probably not. If you sign a Faustian bargain, don’t be surprised if the Devil doesn’t stay true to his word. Meanwhile, the neocons are saying that we should be worshiping at the feet of Dear Leader Bush because he has stopped all of these terror attacks. What they neglect to mention is that he started them, too. Already, many Republicans are clamoring for another terrorist attack to remind people of Bush’s steadfast leadership… or something. With the neocons’ prospects looking dim, they might just get their wish.